29. I just turned it.... next is 30. I want to be a great 30. I have accepted that I am no longer as young and vibrant and wild as some may be in their youth. I am not (nor have I ever been) part of the party croud. I think 30 will suite me. It really probably always has. I fit in better here. A mother and wife. I am happy here-- probably for the first time I am content in my age. 30 does mark where you become "that woman in the grocery store". You are officially "mam". I am going to embrace 29 and use it to prepare myself to be a great lady. 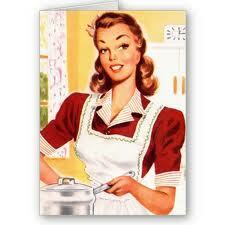 I want to be a wonderful cook. You know.... I want my kids to remember Mom's potato salad. My husband to think no one cooks better than I do. 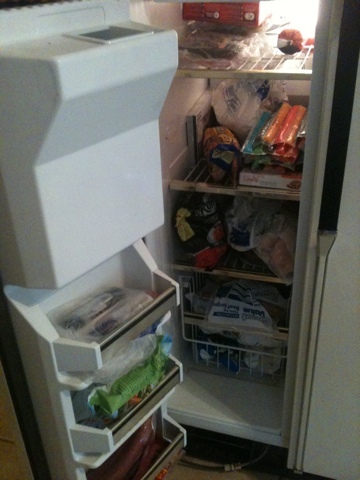 For my children to crave a home cooked meal when they do eventually go off to college. I want them to remember the little things I do with them that makes me Mom. It will take a while to build my arsenal. But I will be domestic. I can feel it. Doesn't that girl look an aweful lot like Addison? Haha! Join me as I spend the next year finding recipes for the best food possible. Ones to write home about. And make and attempt to find my style again. It is so easy to lose yourself in your children. I don't want to be the woman who let herself go all of her life. It has been long enough. That is one thing about all of those Ad girls... They were always put together. Saw a similar pin on pinterest and decided it would be too much fun to pass up doing! 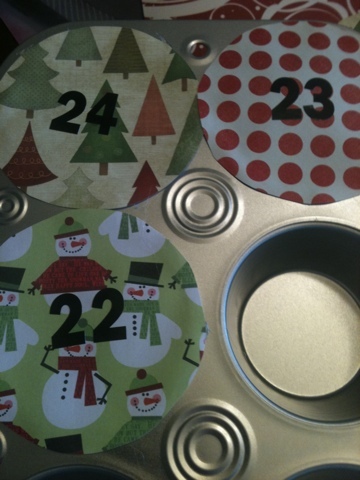 You use muffin tins for the 24 day count down. The original pin wanted you to make circle covers with magnets , but I decided it would be more fun to poke through with your finger like the old game on the price is right!! And my kids would probably take them all off! 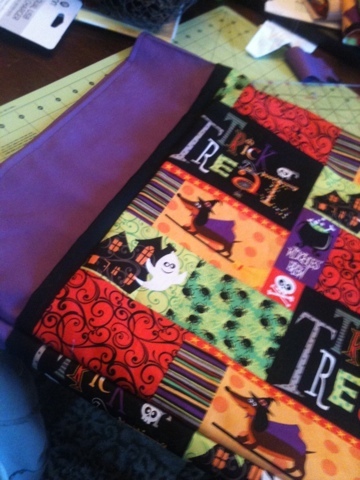 I used scrapbook paper, stickers and a glue gun! 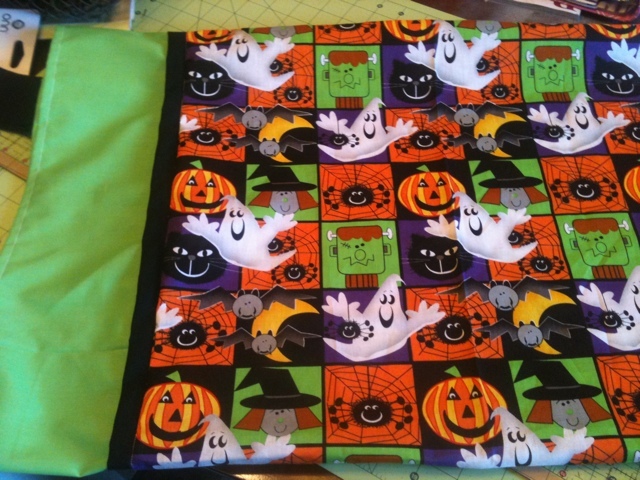 I will have to post pics later of the finished project! 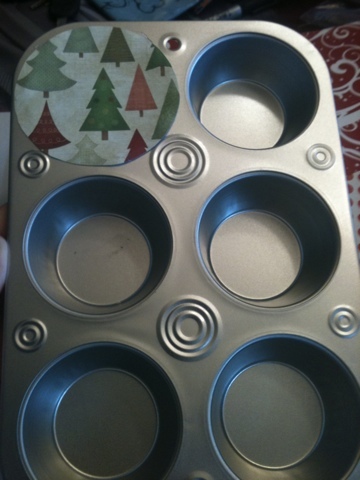 In the meantime I will be searching for small items that will fit into the cupcake holes for their surprises! If you have any good ideas please share!!! This was probably the saddest and hardest part of the project so far. We gutted the entire house. We had to remove a majority of the flooring in the living room and kitchen. We had to even dig a crawl space to repair and brace some of the floor joyces (spelling?) Years and years of existing had accumulated lots of dirt under the house. And... there are bottles everywhere under the house! Some soda bottles from the 70's, milk bottles, mason jars, and lots of strange unidentified bottles. It was like opening a time capsule! We really still don't know why. I tried googleing it. I seriously doubt it was to ward off witches. Any comments with input would be appreciated. Curiosity is killing me!! WHY?? Here is the space in the kitchen. As you can see from this picture... there was a ton of brick just hanging out in the attic! Scary! It was overwhelming... and one huge mess. All of the sheetrock, from walls to ceilings was torn out. Surprisingly... there was no insulation anywhere in the house! That had to make for some cold winters and hot summers. We did find a newspaper from the Nixon era covering a hole in the living room. I had a pic, but can't find it at this time. Here is a look into the living room. You can see some of the electrical boxes going in. We had the house re-wired. There was some interesting "period" wiring going on in there. Half was the old wire and post kind. (with exposed wires in the attic) and the other half was different. A lot of older houses had the electrical wiring in the door frames! Interesting! Here is the new flooring going in! And this house had more nails than I have ever seen in one place at one time! I had to take them all out so we could put in new sheetrock! There seriously was one or in some instances two or three nails every inch or so!! But hey, I already have great plans for my kids and neice and nephew. When we were little, my grandpa and grandma brown, had a big magnet that was tied to a string. 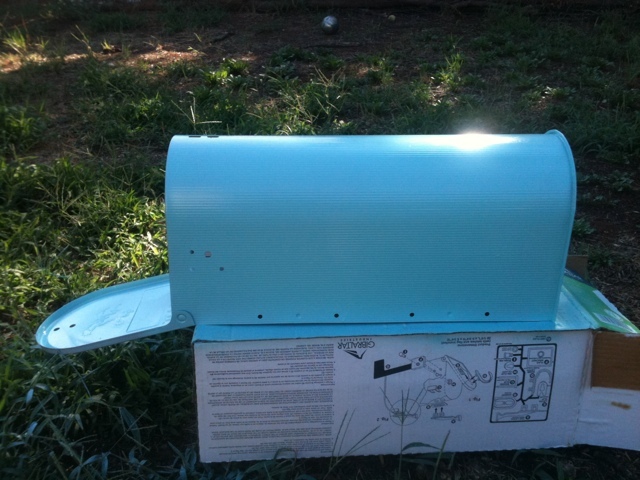 We used to drag it around the yard hoping to find nails or screws. We got a penny for each nail and a nickel for each screw or washer. It was a huge treat! Then Grandpa would take us to Turks country store or Inskeeps store and we could buy single reeses cups that were $.05 each. They would get put into a very small paper bag. Occasionally we would change it up and get some of the peppermint patties... but reeses were definetly my favorite! Turks still sells them this way in the same place by the cash register. I can't wait to do this with the kids! Memories... fill em with warm and fuzzy... that is my job as mommy. The mere sight of these small paper packages or the selection jars by the register take me back. Here is the part of the house that has me twitterpated... The old doors... with all of the character in the world. Every knob is different. The detail is amazing. We salvaged all of the doors and trim above the door frames and windows. I have spent a lot of time around paint... let me tell ya! Four prongs?!? Our electrician asked to keep one of them!! He said that he had never actually seen one in person! Still one of my favorite parts!! Our main goal... after doing some soul searching with Dave Ramsey when he visited our church was to get out of debt. We decided to sell our home and move back to the small town where I grew up. I longed for simpler times and places and could think of no better place. Anyone that grew up in warwick would have to agree that you can't get closer to Mayberry than Warwick Oklahoma.--- well... minus all of the stores etc... My children will start school next year so that became our goal date. We origionally were planning on buying a cheap trailer (which proved to be a bigger task than we imagined) but ended up with an old house that was across the street from my mother!.. Perfect! Everything just sort of fell together. (Which I believe to be a God thing) Fixing up this house has taken us on quite a journey... and I have LOVED almost every moment of it.... We still have a ton of work to do... but are well on our way to moving and then the daunting task of selling our home in Edmond. I dread it.... I am so scared! 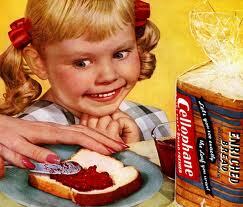 (There isn't much that truely frightens me... but this may just be it!!) Selling houses, and people.... that pretty much sums up my fears.... ok.. and alzheimers.... and car accidents, and childhood diseases. That's it. Anyways.... I was wanting to share with you some of our progress. It has been a ton of work... but I am falling in Love! A view from the outside. Our sweet country home! The house belonged to one of our dear neighbors that I grew up around. I never imagined myself ever living there! I think I had only been inside once or twice when I as a girlscout was selling cookies. 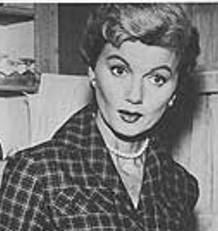 Lorene always bought cookies. I looked forward to going there. I can close my eyes and still see the family gatherings (mostly around fourth of July and Easter) in her yard. We were only spectators.... but I still felt close to her family. It comforts me to know that in this house before me, there was love. My dad tells me stories about growing up here sometimes as we sit outside under shade trees after working hard all day. I long for the day we will be here all of the time. I am really ready to do some front porch sittin! Yes, that is roofing material on the side of the house.... Like I said.... we have got some work ahead of us! This is what will be the kids bedroom. I LOVE LOVE LOVE the old windows. The light in this room is amazing. It is always bright! I really do wish I had taken more pictures. But it is what it is. 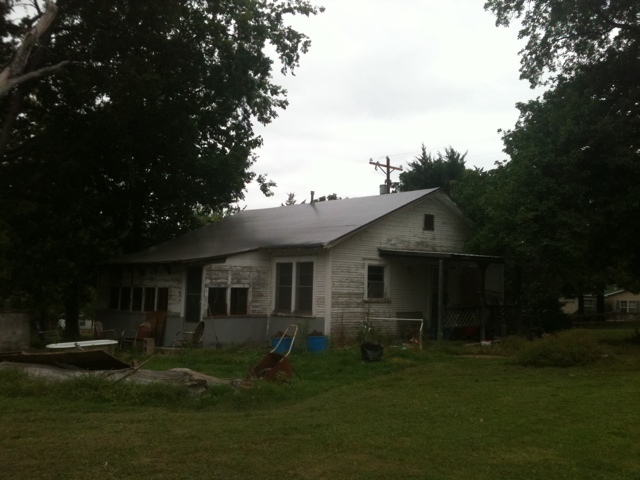 The transformation of this house is hard to believe! And we are doing all of the work ourselves! With a lot of help from friends and family who know more about what they are doing! This is probably the smallest bathrooms I have ever seen! My husband jokes that you could sit on the toilet and bathe the kids ... and he isn't kidding... you probably could! The Tub has came out and will eventually follow us to a home we will build later on down the road. I Love clawfoot tubs. This tub has seen many coats of paint in it's day. Way too many for me to refinish myself on my budget today. And little ones really need a safer tub. One day. The bathroom walls are definetly an add on. Back from the days of outhouses. I bet it was a really big day when they got an indoor bathroom in this home back in the day! My grandparents had an outhouse when I was a child. It is so neat to be in a home with so much history! This bathroom is Jack and Jill before it ever existed! Cabinets that were build into the frame of the house. Unfortunately we were not able to save them. :( We tried. They were just in too bad of shape.. I loved the character! We did not keep the carpet that was throughout the house. I can't believe I didn't take any before pictures as we took this out! But it was the first thing to go! This was probably one of my favorite parts. Talk about security! This was the origional door going off of the back porch. I remember having a couple in the small house that we grew up in. My favorite one is the bent nail. It reminds me of my grandmother! Anyways.... we are further along now... I just wanted to show you the beginning. I hope this will be a happy fresh start for our family. I know these pictures also bring back fond memories of happier times for this family. This house had been empty for a while. It is sad what time takes away from a home. To many more memories that this old house gets to be a part of.... to holiday dinners, birthdays, toothfairies, first days of school, cousins visiting, everyday breakfasts, game night, happiness, sadness and all that life brings. 1. 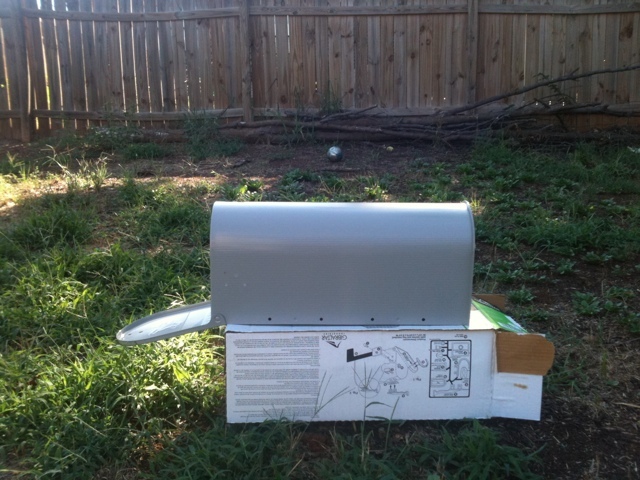 You need a mailbox. I got mine at home depot for $12. 2. Spray paint. 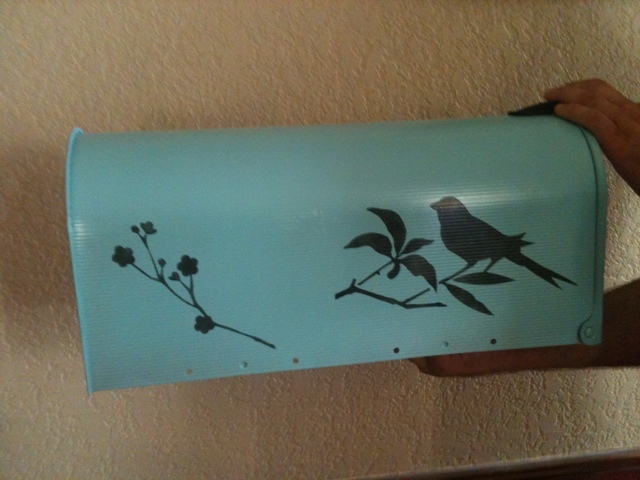 You need your color and a clear coat to protect your stickers fir your address. 3. Stencils. Hobby Lobby has a great selection and the stencil paint Is all right there. I used a cream based one and a sponge applicator. 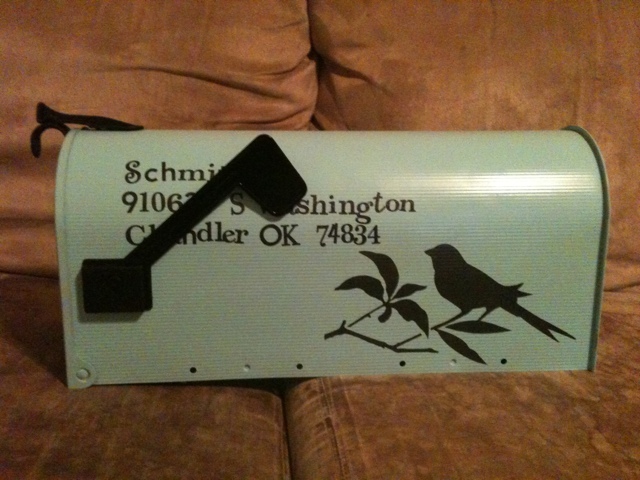 Start by spray painting the mailbox. Use short spray motions like directed on the can. 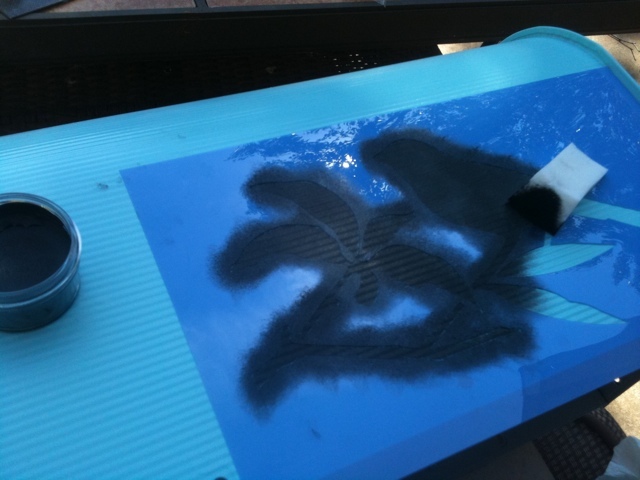 (it drips very easily since it is metal) Allow to dry completely and stencil on your design. Keep in mind placement of your address and flag. 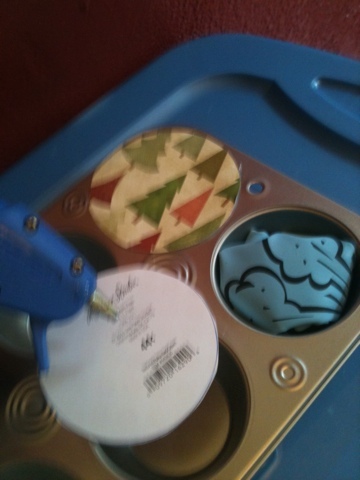 Allow to dry again before applying stickers and finish with a clear coat. I've always been a list person but I may have to find a better system for our weekly menu! I try... Really, I do! I make lists before I go to the store. I even make food we can make with the stuff we buy lists, but they never get made.... And we buy more stuff.... Then stuff goes bad and gets wasted. It's a never-ending cycle! 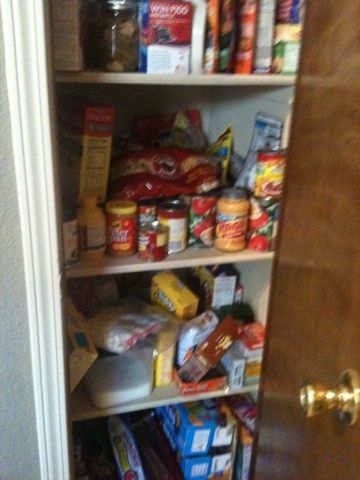 I like having a stocked pantry, but I need to use all of this food! There are too many who go without to have me struggle with organizing my meals! 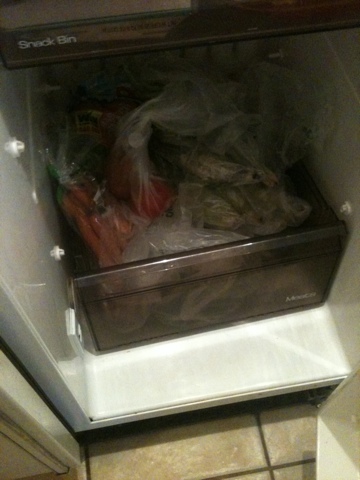 My pantry is overflowing, freezer is full, and deep freeze is about half full. Here's to a challenge and to getting creative... To only buying what I need. Join me.... And yes Amber, this is for you! We made a trip again today to get pictures made. It was Addison's 2yr pictures. It works out great for the spacing of my children. They are 17 months apart, so we roughly get pictures every 6 months. ( So far it is one of the few things that having them this close together actually works perfectly for! LOL) Although it was easier than it was last time, it was still quite an effort. Brayden did pretty good, minus a couple of short lived tantrum about wanting to go back to the lobby and play with the legos. Addison however is a different story. They are so different. I know EVERYONE tells you not to compare your kids, but it is soooo hard! Brayden is such a people person. He warms up easily and talks to everyone like you are a long lost cousin. Addison does not. We could hardly get a smile out of her. She has been like this at EVERY attempt at taking her pictures. She is skiddish and won't smile or play. She looks so unhappy. She even frowns and glares at the photographer. She can be really sweet to them (she tried to get the helper lady to pick her up.. she just doesn't want her picture taken!) I just don't know what to do with her! We have tried everything! Despite her difficulties, we did get a couple of good pictures. (and even one of her smiling) We really didn't want to do anything after we got home. We were drained..... It is crazy how tired we are after just taking the kids for pictures! I do have a couple of goals for the month of August. 1. Get to bed between 10:00 and 10:30 every night --- sounds easy.... but I have not been sleeping well since the time changed (weird I know! I literally think,, hmmm it really should be 11:00pm now, all of the time!!) This has to stop! Some nights I stay up until 1:00am and get up at 5:00am to go to work. 2. Loose weight.... at least 5 pounds... which isn't looking good considering I just ate 6.... okay, maybe 7 oreos and a glass of milk. Classic Winnie the Pooh birthday party! 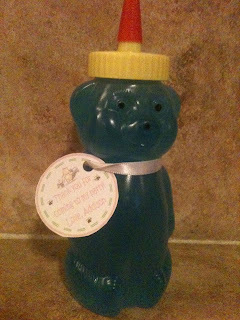 For her gift that I am handing out in place of gift baggies, I filled honey bears with bath soap and had thank you tags made!! 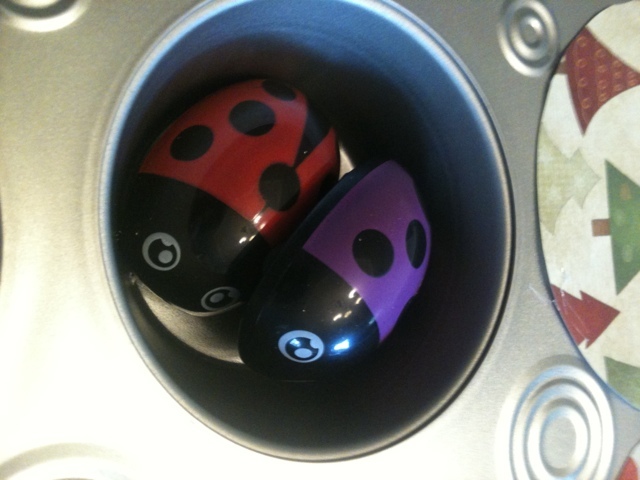 They are soooo cute, and what 2yr old doesn't love a bath! I am sooo proud of this that I am attempting to add it to pinterest :) They only had clear or blue soap at walmart tonight, but you really could use any color/flavor etc. 1. I purchased the honey containers from a supplier for people who bottle honey. I checked around quite a bit before I found a company that A) wasn't outrageous, and B) didn't charge crazy fees for small orders. I got 24 bears for about $24. (not bad at all) and they were one of the only companies that included the lids. You can get almost any size and color of lid, and their shipping was fair and fast. http://www.dadant.com/catalog/index.php?cPath=33 2. 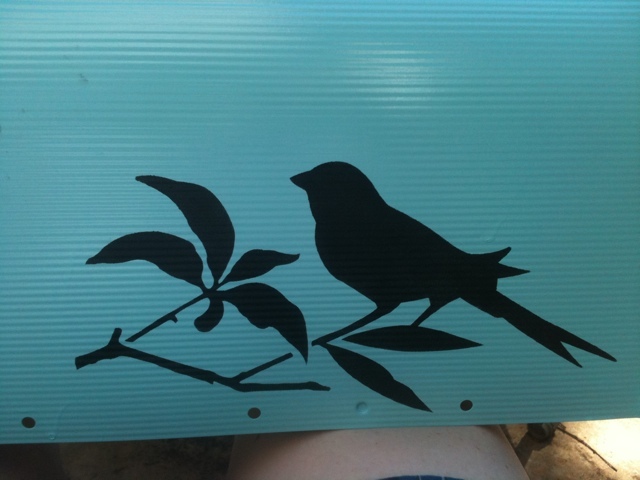 I had all of my printables made from a dear friend of mine that can do anything! She completed my whole party package for $25!! (Including my invitation, bunting banner, thank you cards, cupcake toppers, cupcake wrappers, party hats, and two sets of tags. She has a facebook and Etsy store. https://www.facebook.com/yahoo#!/PolkadotPrintables http://www.etsy.com/shop/KWPCreations 3. The rest was easy! I purchased the bathsoap and I recommend a funnel! Everyone LOVES them so far! 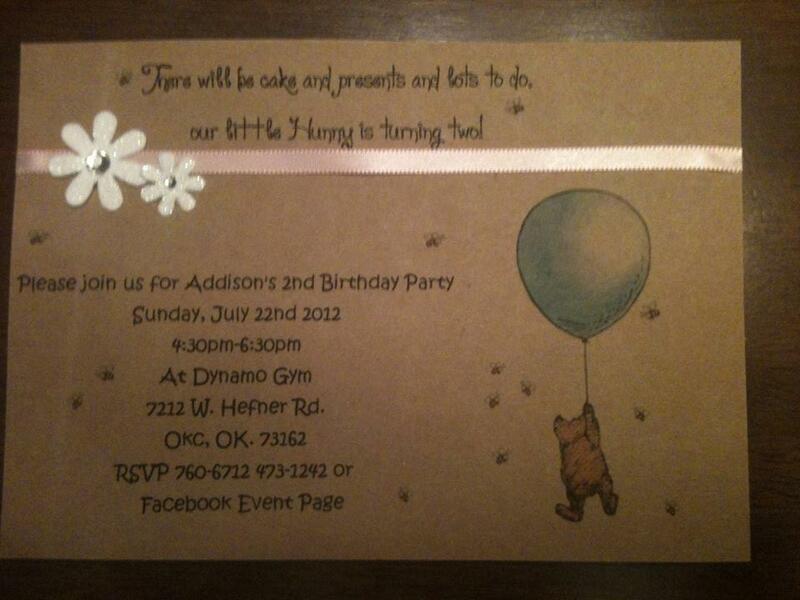 Here is a pic (taken from my phone) of her invitation. I lOVE how it turned out! I purchased the cardstock at Hobby Lobby and picked out the pics and sent Kristen at Polkadot Printables my wish list and printed it at home. Add embelishments (also from Hobby Lobby) and walla.... Classic Pooh.... not available in stores. It definetly takes me back! 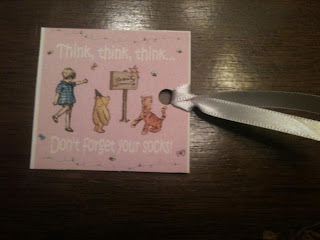 There is just something sweet about classic pooh that storebought just doesn't measure up to. 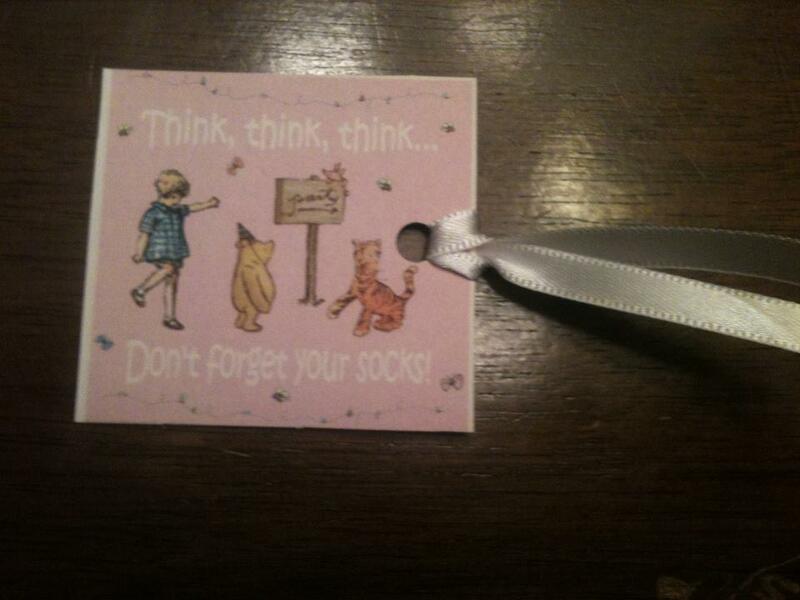 Here is the sock tag (for a reminder since her party is at a play zone place) I included it with her invitation. The Honey pot will be used as a center piece. 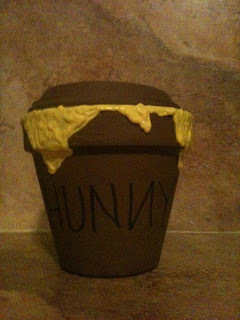 It is simpley a clay pot (from Walmart). I used a sharpie and some yellow puff paint for honey. The saucer is turned upside down and glued onto the top! So easy!! 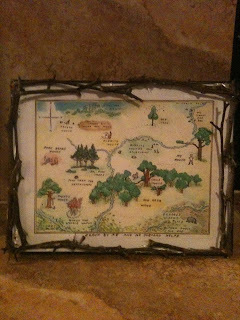 I printed a picture of the hundred acre wood (from the front of almost all winnie the pooh books) (also there are several if you just use google images) and put it in a picture frame ($1.97 at Walmart) and hotglued twigs to the frame for a woodsy look. Cost almost nothing and is sooo cute! I can't wait for her party!! More pics to follow! Oh.... and her outfit! Pics and where I got everything definetly to follow!! Working as a nurse, I get a daily dose of how precious life is. You are never guaranteed another day. This blog will exist so that my children and family could get a closer glimpse of me and know just how much I love them.